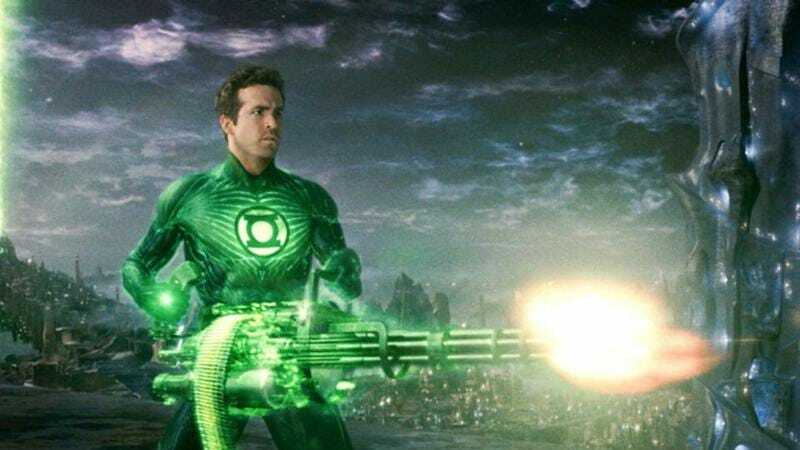 Along with the similarly timed and equally reviled Jonah Hex, 2011’s Green Lantern movie was one of Warner Bros. and DC Comics’ first attempts to ride the current wave of superhero movies and get a non-Superman or Batman-based comic book franchise off the ground. But the film’s box office failure—barely making back its $200 million budget, most of which appears to have been spent on slathering bright green CGI on every available surface—seemed to have killed those dreams. Until now, anyway. As part of Warner’s Comic-Con panel today, the studio announced that it was giving Green Lantern another shot. We don’t have any casting details or release dates yet—the announcement was done via a concept art reel, smashed in between footage of Hugh Jackman’s Pan and the new Suicide Squad trailer—but we do have a name: Green Lantern Corps. That name implies a more team-based film, raising the possibility that Green Lanterns beyond series protagonist Hal Jordan, like Guy Gardner, John Stewart, and newbie Kyle Rayner, might all get a chance in the big green spotlight. In any case, it’s unlikely that Green Lantern star Ryan Reynolds will be reprising his role in the film, because he’s busy with Deadpool, and also because he already said that he really doesn’t want to.